In this episode we prove that stalking celebrities outside of a porta potty can pay off. After Caryn, Brittany and Laura Bailey had a chance encounter with Ultrarunning Champion and Marathon Maniac Mike Wardian before the Big Sur Marathon, he agreed to come onto the podcast and answer your questions. From his start to the sport as a college senior, to qualifying for the Boston Marathon on his first attempt to some of the crazy records he’s set, you’ll really enjoy hearing his down-to-earth and accessible approach to the sport. You can follow Mike Wardian’s race schedule on his website at http://www.mikewardian.com. He’s also active on social media – follow him on Twitter @MikeWardian, Facebook @MikeWardian and Instagram @MikeWardian. Please SUBSCRIBE, RATE and REVIEW the podcast on iTunes. It helps improve our ranking in search results, which means more people will have the opportunity to learn about the joy of running with friends and putting fun in your run. We want to hear from you! 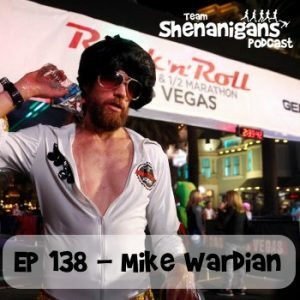 Please follow @TeamShenanigans on Twitter and http://www.facebook.com/TeamShenanigansRunning on Facebook and let us know what you think of the show.